Preserve privacy and minimize moisture and odor in your bathroom with our full selection of bacteria and mildew resistant Shower Curtains. Once you complete your shower�s interior changes, with Shower Drain Covers, Shower Grab Bars, and a Shower Seat, cover it with a shower curtain that is custom cut to fit your shower. Put on those Rubber Gloves because these curtains are easy to clean: just wipe them down without removing them! When thinking about fire safety, did you think about whether or not your Shower Curtain is fire resistant? 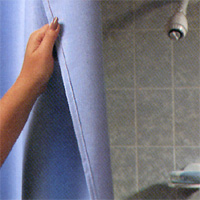 Use the Mildew Resistant Shower Curtain for Gymnasiums, Boats, Health Clubs, Public Showers, and Hospitals. 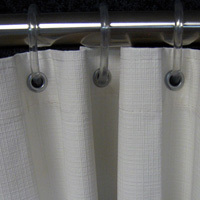 Hookless Shower Curtains are also very stylish in Hotels and at Home. Choose from a number of different colors and get your curtain Custom cut to fit your shower.